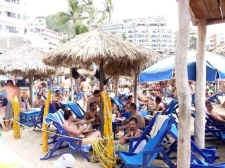 For years the Puerto Vallarta gay beach has been known simply as the Blue Chairs, the popular beachfront bar, restaurant and resort located near the southern end of Playa Los Muertos, the principal Vallarta beach. 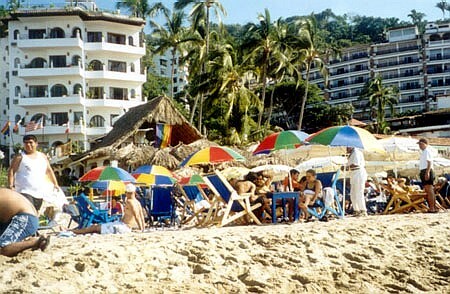 The gay beach in PV also includes a good portion of the Green Chairs next door at Ritmos Cafe-restaurant. The friendly clientele sit under the many round, thatched palapas for shade or lay out on their towels to soak up the tropical heat and Mexican sun. 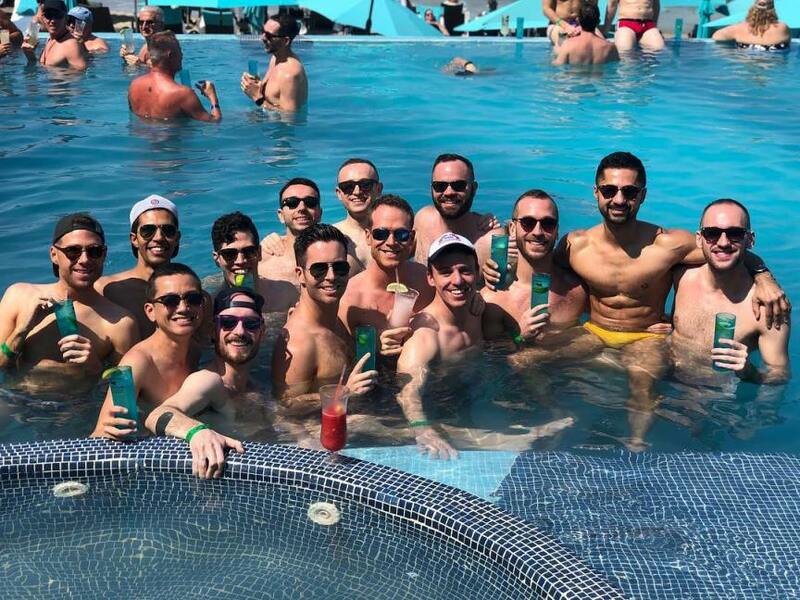 On any day of the winter high season, there are several hundred gay men sunning, partying, talking, eating, drinking, cruising and playing in the water. The surf can be rough at times, especially during the winter months, so be careful getting in and out. 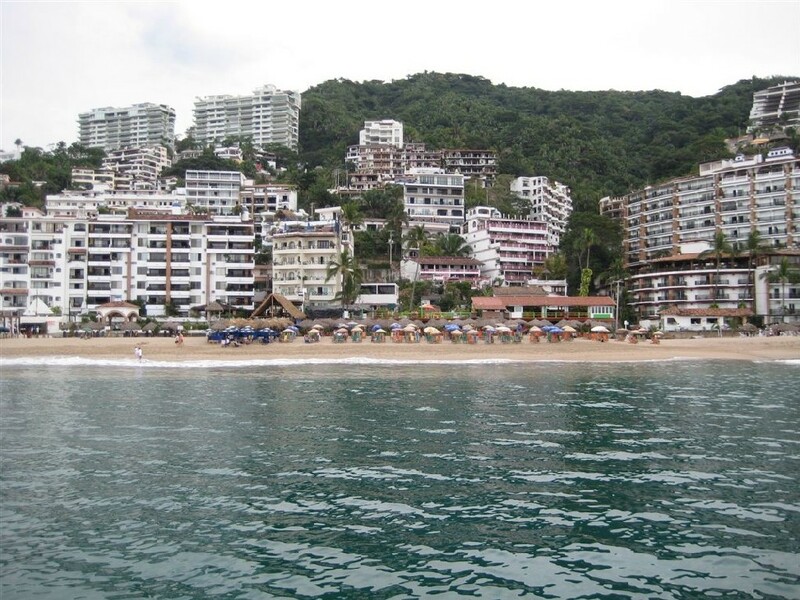 To add to the pleasure of these gay-friendly Puerto Vallarta beaches, from which nearly all of Banderas Bay is visible, starting in November until late March a sighting of whales or schools of dolphins is not unusual, so keep an eye out and your camera ready. The Green Chairs usually plays a good selection of music on the stereo: rock, reggae, disco and pop, in English and Spanish, and on weekends often has live bands or a DJ spinning; the Blue Chairs sometimes tends to be a bit quieter area during the day, though the Blue Chairs hotel rooftop bar and restaurant at night with its stripper and drag shows is popular but noisy. The Green Chairs has seating in the open patio areas in the restaurant, as well as on the Puerto Vallarta Los Muertos beach. Both locations have loyal customers for any number of good reasons. 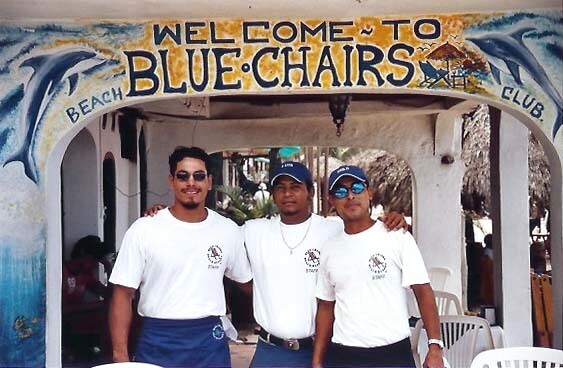 The Blue Chairs tends to attract a large and faithful gay clientele as it has been the traditional gay beach area in town now for some 25+ years and does have that nice big palapa seating area. 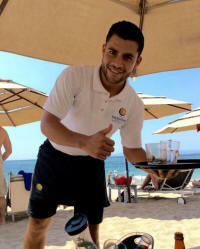 I have found the waiters at both places to be amiable and attentive and some waiters have been there for many years. As in all vacation resorts in Mexico it's a good idea to check prices when ordering food or drinks, keep careful track of your tab, and count your change. 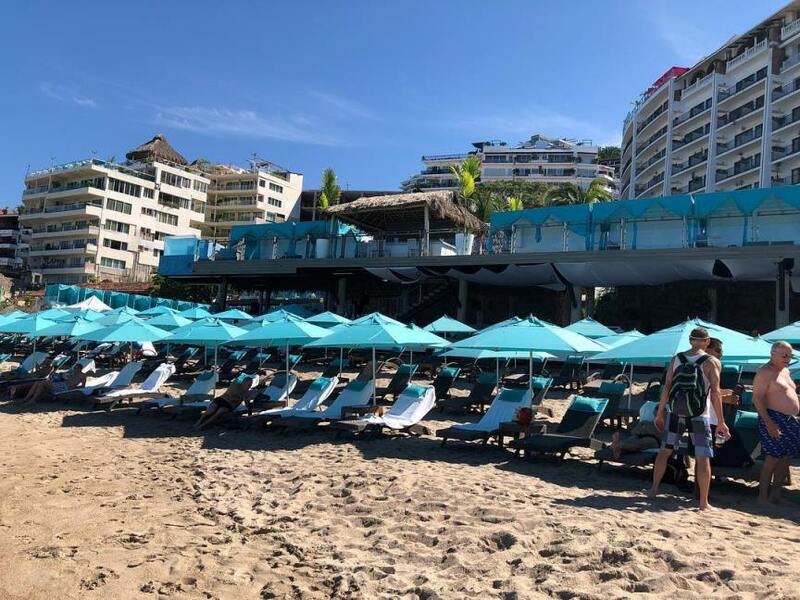 The size of the gay beach area has expanded during the last few years to include the Sapphire Ocean Club, located directly in front of the One Beach Street Vallarta condos at #1 Malecon street. Sapphire offers amenities including breakfast and lunch menus, a small dipping pool and drinks. Also part of the gay beaches scene now is the newest addition, Mantamar Beach Club, in front of the Almar Resort at the southern end of Los Muertos. Mantamar has sun loungers, a very popular infinity pool scene, as well as lunch and dinner under its enormous thatched palapa, serving from sophisticated gourmet dishes to traditional international food. Promotes itself as an "oasis of fun in a modern atmosphere, full of music, luxury and VIP services". Pricey. A trendy choice which has sunset shows and pool parties during the winter months. Previously run by renowned chef and owner of Puerto Vallarta's fine Cafe des Artistes, Thierry Blouet. Both of these newer beachfront places are located practically adjacent to the traditional Blue and Green Chairs. There are discussions about which is the best or most friendly, so check them out and decide for yourself. Sapphire is the only one that is exclusively gay-owned and all, except for the Green chairs or Ritmos cafe, have gay staff. 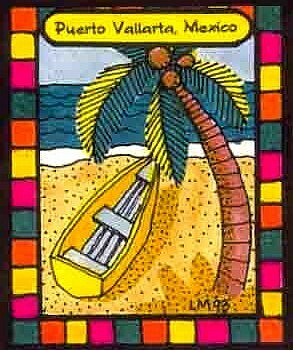 David Kirby in a relatively recent New York Times travel article on gay Puerto Vallarta noted that the guys on holiday at the beach were friendly, "mostly over 30, and mostly from the Midwest or West Coast. For a gay beach scene, it was pretty low key. Many there said they go back to Puerto Vallarta every year, not only for the gay scene but also the relaxed atmosphere and gorgeous natural surroundings." Adding to that, PV perhaps compares pretty well with some of the other best gay beach vacation resorts such as Fort Lauderdale, Rehoboth, South Beach and maybe even Provincetown, relatively speaking. I'd call Vallarta as having one of the largest and best gay beaches in Latin America - and it makes it into the top ten in the world over at Gaycities and also Gaytravel at About. Local beach vendors will approach you with a wide variety of goods: quality silver from the mines in Taxco Mexico, brightly colored Mexican blankets, lace tablecloths, clothing, hand carved masks, basket work and fresh baked pies and muffins, to name a few items. You can eat, cruise, party, sun, shop and chat at the same time - talk about a tropical paradise! What a great way to spend your holidays! Good buys can be had, particularly if you know how to bargain. Vendors in town will often ask more than what they are willing to settle for, especially during the slower summer months. If you aren't interested, a simple 'no, gracias' will send these friendly vendors on their way and you can do your shopping later at any of the hundreds of local Puerto Vallarta stores and boutiques around town. 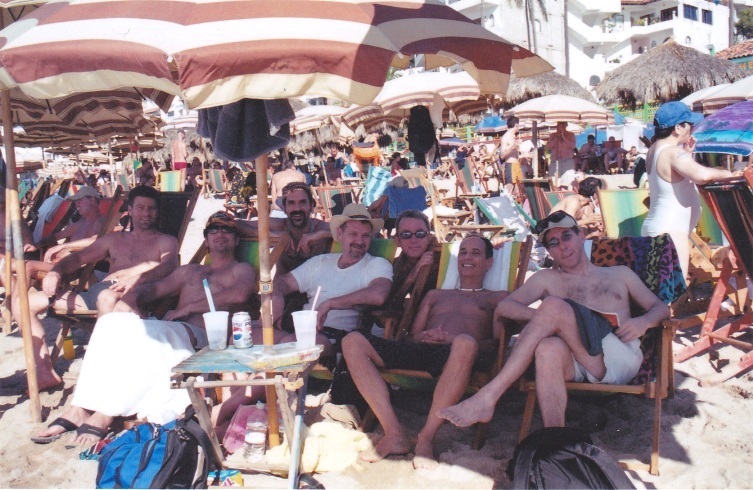 Gay men on vacation holiday and at the beach in Puerto Vallarta tend to be more relaxed and open than they are at the gay night clubs, so use this opportunity to make new friends. If you are into Mexican men, there are some good looking ones around. Sunday is their one full day off work and many guys spend it at the Blue and Green chairs, usually with a group of friends. There are also a number of hustlers on the make at the beach and in the town's night-clubs and bars; if you take one of them home be aware of what you are getting into. Travel tip: I would say it's a wise idea for you to take good care and keep track of your money, personal belongings and valuables at the gay beaches, and likewise when inviting someone home. Read more helpful travel advice. The Blue and Green chairs in Puerto Vallarta, Mexico is an extremely popular gay beach destination and is not to be missed. The party often lasts from late morning until close to sunset. 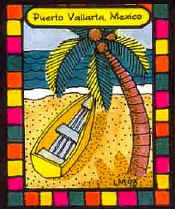 By the way, all the beaches in Mexico are public, though some hotels and resort areas sometimes try to restrict access. 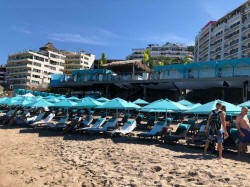 If you have accommodations on the South Side of Puerto Vallarta it is pretty much a short walk to the Blue and Green Chairs, with its location some 200-300 yards south of the Los Muertos pier. From the hotel zone on the North Side of town it's a 15-20 minute taxi ride or so, which may cost approximately 50-75 pesos or so. 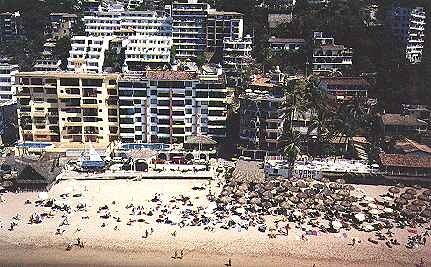 Just ask the taxi driver to take you to the Blue Chairs or the Blue Chairs beach resort hotel on Los Muertos beach. If you take any bus marked "Olas Altas" on the windshield, get off at the end of the line when the bus makes the turn around at the Lazaro Cardenas Park. You are then within a pleasant 10-12 minute walking distance. Coming from Conchas Chinas or other South Shore lodging, it is definitely easier to take the taxi because the buses don't run that frequently and drop you off further away. The two weeks of Christmas-New Year are the most popular time to be here in town (Thanksgiving week is the second most popular gay beach holiday time in Vallarta; and Semana Santa or Holy Week at Easter time is the third favorite). Many gay men return year after year and know each other, so the feeling of camaraderie in town is particularly strong and it's a period of many fun parties, get-togethers and reunions. The Puerto Vallarta gay beach area and environs consist of the following: Blue Chairs beachfront restaurant, calle Malecon and Almendro #4, Tel: 222-5040; the Green Chairs also known as Ritmos Cafe, 177 Malecon, Telefono: 222-1371; Sapphire Ocean Club & Lounge, #1 calle Malecon, Telephone: 223-3264, which is gay owned with mixed clientele, Daily, 9am-Midnight; and the Mantamar Beach Club, 169 Malecon, 10am-11pm, Tel: 222-6260. For your information, the Blue and the Green Chairs, as well as Mantamar, are straight-owned. At the southern end of Playa Los Muertos is a large rocky outcropping. There is a narrow path that leads up and over. This is the beginning of Conchas Chinas beach, which is not really one but of several small, sandy coves along the seashore (photo at left) among a series of these rocky outcroppings. If you are looking for a more private, secluded experience (with very few vendors out selling trinkets, for one thing), you may find it in along the mile or two stretch of the coast in this tranquil seafront part of town. The waters are clear and shore-fishing, swimming and small gatherings of friends and families are popular. These beaches are accessible off coastal Highway 200, also locally known as the Highway to Mismaloya. The Lindo Mar Resort restaurant is one of the few places along the coastline in the Conchas Chinas neighborhood to catch a decent bite to eat. 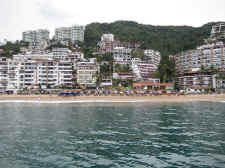 The hillsides overlooking the Conchas Chinas waterfront have become populated with luxury condos and villas, which often offer spectacular views. It takes a good taxi ride up the winding hillside roads before you get to the top of the developments, but the rewards are the best Puerto Vallarta views and sunsets, with the entire 600 square miles of Banderas Bay stretching out before you. A good number of the sunset bars in town have somewhat similar lovely panoramic views. Unfortunately, the authorities in PV and the State of Jalisco have not had the good sense to control the development in many parts of town and the surrounding areas, and so the charming Alta Vista, Amapas, Conchas Chinas and South Shores areas in particular are in danger of losing their appeal, and their palm trees, as more and more condos and villas go up along the majestic hillsides and along the stunning Puerto Vallarta beaches. It is well known that Banderas Bay has suffered for years from the stress of so many people using its resources, with problems ranging from over-fishing to agricultural runoff. The Los Muertos oceanfront though is still a lovely gay-friendly beach destination and is the magnet pulling the gay clientele to the Blue and Green chairs and the general South Side or Zona Romantica part of the city. Note: We ask our clients and friends to boycott the jet skis, which pollute the air and water and destroy natural quiet. Reports show that at least 25% of their fuel goes directly into the water and we would like to help current environmental efforts to clean up Banderas (Flags) Bay. For further information on many local environmental & charitable organizations go here.